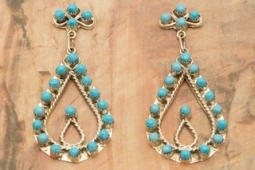 Beautiful Zuni Petit Point Design featuring Genuine Sleeping Beauty Turquoise set in Sterling Silver Post Earrings. The Sleeping Beauty Turquoise mine is located in Gila County, Arizona. Created by a member of the Zuni Tribe. The Zuni Pueblo is located in New Mexico, Land of Enchantment. Earrings are 2 1/8" L x 7/8" W.